Just got a mail from János László, president of the Hungarian Cyclist's Federation about a milestone reached yesterday in Budapest. 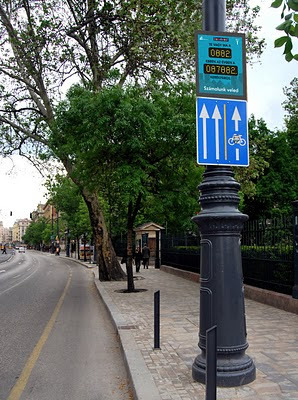 Five months ago they installed a bike counter on one of the streets. Yesterday, they reached the 100,000th cyclist. In the rain, too! Wonderful. Here's a film of the moment. Our Hungarian friends are, understandably, very excited about this. And well they should be. Congratulations! Aron from Hungary Cycle Chic made the film. Budapest is an inspiration to other cities just starting down the road to reestablising the bicycle on the urban landscape. Out of nowhere they now have about 5% modal share and they have an amazing group of people working hard at branding the bicycle as transport for Citizen Cyclists. Check this tag for more inspiration from Budapest.